Though the end of October is approaching quickly, we have been treated to some of our best trips of the whole season! We only had to travel about 13 miles, and we found eight humpbacks! 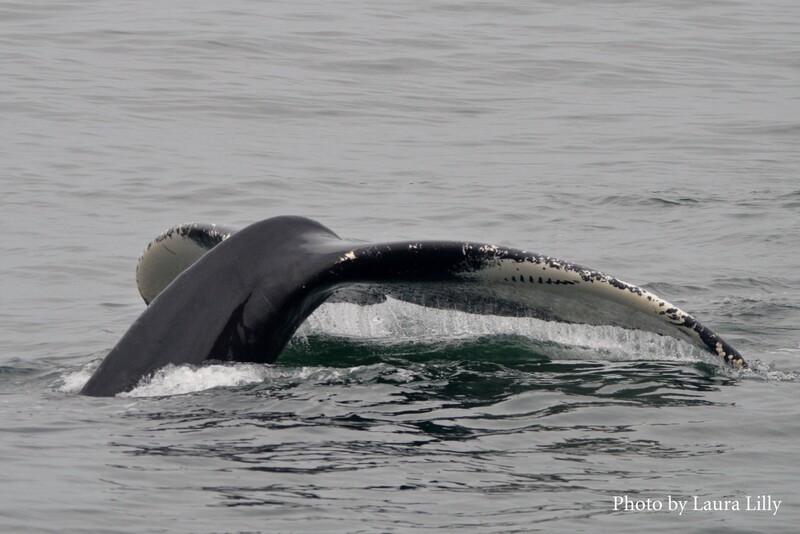 We began with a pair of whales, one of which had a very distinct dorsal fin and we knew it was a new whale for the year. The second looked a bit smaller, but still quite large. We were wondering if we had come across a mother/calf pair, and sure enough we were able to identify the adult as Freckles, a whale that we had suspected last year might be pregnant. Within a few minutes of watching this pair, we noticed multiple other whales in the area, so we decided to investigate. 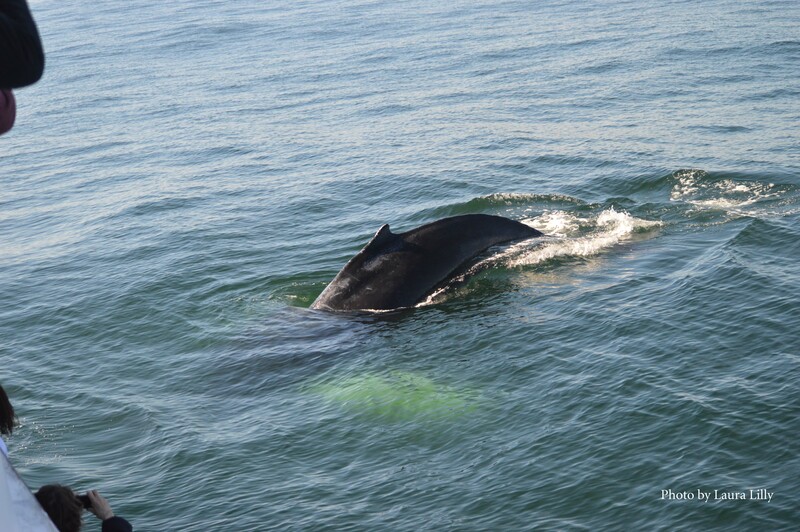 We found a trio of humpbacks in association- Nile, Echo, and a whale named Palette (new for us for the season). While watching these three, we could see a full breach from another humpback about 1.5 miles away! We received word of another mom and calf pair (two in one day! ), and we made our way over and found one of my very favorite whales, Owl, and her calf, who became a little curious about the Hurricane II. They were with another new-to-us whale, Othello. Owl gets her name from the distinctive circles on either side of her fluke that look like owl eyes. Like many babies, humpback calves will sometimes do some investigating of the world around them. 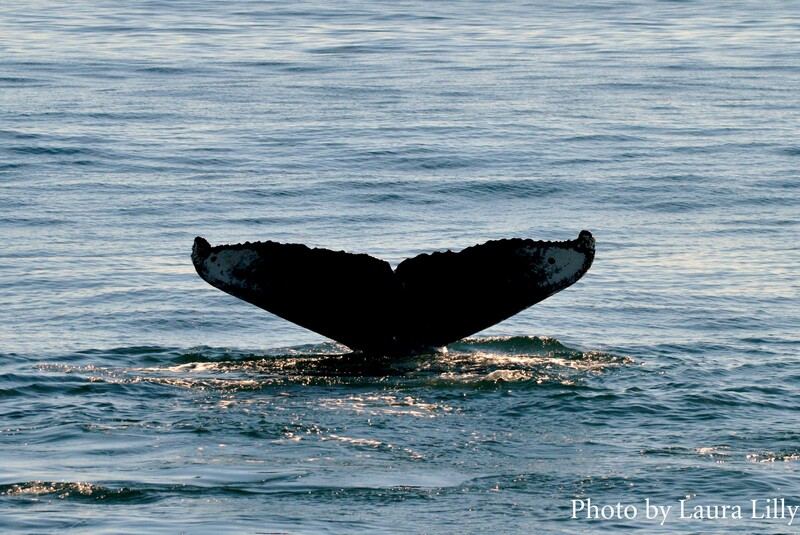 It seems as though some of the most sightings are coming toward the end of our season- hope you can join us in our last week of whale watching! We were with you on Thursday October 17th & were lucky enough to see what you called a ‘new’ whale with a name that began with “N”. Then a trio gave us a lovely synchronized dive – Nile, Decimal & Echo which made for a fantastic photo. Thanks to a great crew for an outstanding day!! !